One & only Kyoto Vegan Auberge caters to one party a night, for your relaxing stay in the center of Kyoto. A comfortable tatami room with traditional garden view is located on the 2nd floor of the restaurant. You will be the exclusive guest, coming with a delightful vegan dinner experience. The Gion House has opened on October 2011, and a traditional Japanese 'machiya' is centrally-located in Gion. 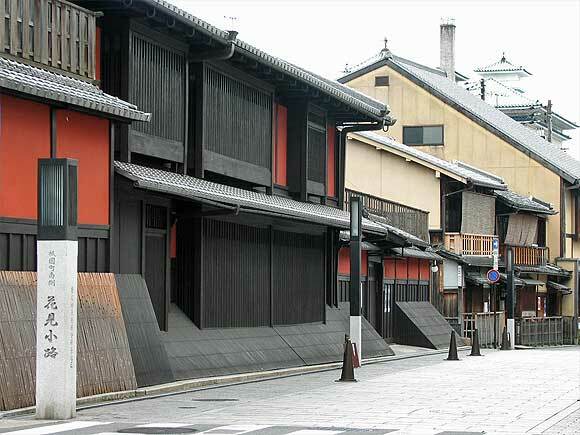 The Gion House was designated Gion historic district building by Kyoto City Government. The Gion House was built in 1892, and was completely restored under the supervision of Kyoto City Government, and it was stand up for historical Gion principle. It is rented an entire house. Our quests may come and go freely, using the house as their own. It is rented to guests for just minimum 5 nights or longer, under a short-term lease agreement basis. The restoration was a labor of love, requiring the participation of artisans specializing in traditional carpentry Kyoto style techniques, and using natural materials in all areas both inside and out. Great efforts were made to recreate an atmosphere, which will allow guests to experience the traditional way of living. Beautifully restored "Kyo-Machiya" that has been converted into the licensed accommodation. Arashiyama (嵐山) area: 3 stops from JR Emmachi Sta. Available to drop off luggages before check-in (after 11am) and after check-out (until 2pm). Room cleaning goes on every two days for the comfortable stay. Higashi Chalet is the two storied machiya (traditionally significant wooden townhouse in Kyoto) which has been built over hundred years and it has been completely renovated this year. This house respectfully kept a sense of traditional Japanese housing aesthetics after full renovation. Antique Kyoto style furniture and furnishings and modern convenience in western style creates a fusion of contemporary and classic atmosphere. Higashi Chalet ( see photo ) locates on the most picturesque and historically significant area in Kyoto. It is very easy to get around on public transport as we are located within one minute walk from Higashiyama metro station and closest bus stop. Easy access to Kyoto's all major tourist spots. Specially in Ginkakuji, Kiyomizu, Philosopher's Path and Nanzenji. Gion, Sanjo, Heian Jingu are within a walking distance. Higashi Chalet is the best location to truly appreciate the beauty and culture in Kyoto with your family and friends. We are now offering surprisingly reasonable opening rate for tourists.